My Jimmy Jib kits are supplied with lens control for Canon or Fuji broadcast lenses and most prime or zoom cinema lenses. We can mount just about any camera to the crane ranging from the Canon C300 to an Arri Alexa or Sony FS7. My Jimmy Jib kits come complete with Sony HD monitors and a 3 wheel base. Kits can also be supplied with a variety of accessories and add-ons including wireless remote follow focus and a whole host of cameras and lenses. Health and Safety is of great importance when it comes to camera cranes and we take it very seriously. Both of my Jimmy Jib cranes are regularly tested and inspected and are maintained to the highest standard. Our Jimmy Jibs can be assembled in multiple configurations. Each configuration comes complete with the remote head system, controllers, HD video monitor, remote lens control for almost any lens (ENG, LANC, EF, and PL / Cine), and a remote follow-focus. We can also provide jib dollies off-road. Need Stanton Jimmy Jib rentals from Italy with a industry well known highly experienced Italian jib operator? Our Stanton jib rentals come with not only the most highly proficient jib operators, but are equipped with tons of custom modifications engineered in only our rigs, designed from years of experience in the Italy film rentals and tv industry. Jimmy Jib Italy also delivers you cutting edge jib rental packages with just a technician so you can also use your own skilled jib operators. We do all the work.. set up your Jimmy Jib package anywhere in Milan or Rome and its surrounding areas, wrap the jib from your location, transport it back to our shop, check it in and make sure its well serviced for its next shoot. Its that easy. Place your order today +39 3382084070 speak english and spanish. 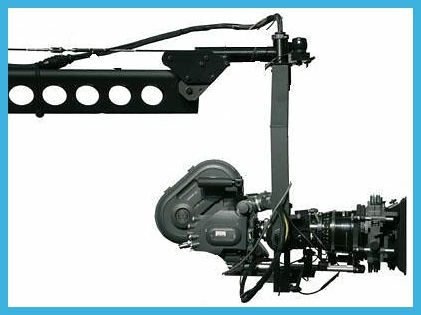 In cinematography, a jib is a boom device with a camera on one end and a counterweight and camera controls at the other. It operates like a see-saw with a fulcrum in the center. A jib is useful for getting high shots, or shots that need to move a great distance; horizontally or vertically, without the expense and safety issues of putting a camera operator on a crane. The camera is controlled by a cabled remote control at one end, and at the other a super-responsive electro mechanic pan/tilt head (hot head) - allowing for smooth pans and tilts. What is a Jimmy Jib? The Jimmy Jib is a lightweight, modular camera crane system constructed out of triangular aluminum tubing. It has a relatively small pack-down size which allows for easy transportation and setup almost any location. Depending on the terrain of the location, the Jimmy Jib can be easily repositioned between shots, wheeled easily and quickly on smooth terrain or with provided time and care moved happily to another set-up point for rougher surfaces. How high can the camera go? Our Jib configurations can allow us to raise a camera to a lens height anywhere from 1.8 meters (6 feet) to 15 meters (46 feet), and depending on configuration requirements can support a camera up to the weight of 22.5 kilograms. This means any sort of camera, whether it be 16mm, 35mm or broadcast/video. See the diagram below for specifics. The strength of the Jimmy Jib it is the "reach" of the crane arm that becomes the important factor in creating interesting and dynamic compositions plus allowing the operator to raise the camera above obscuring power-lines or animated concert goers - thus allowing for a clear, high wide shot if need be. With the "Triangle" Jimmy Jib set up in an "under-slung" configuration, the camera can be made to rest almost directly off the floor - making the minimum lens height about 20 centimeters (8 inches). Of course, if you're willing to dig a hole, cut away a section of the set or shoot on a platform this minimal lens height can be reduced. How long does it take to rig the Jimmy Jib? We always suggest up to 2hrs to rig the Jimmy Jib. This will obviously depend on vehicle proximity and the working environment. How easily can the Jimmy Jib be moved between locations? After the initial build, the Jimmy Jib can be repositioned easily across level and clear ground on itʼs wheeled base. If the location doesnʼt have level terrain then a rebuild can take from 30mins+, depending on distance and conditions. What is the required operating area for a Jimmy Jib? Depending on the size of the jib and the amount of counter-weight required, the necessary space required to make the jib "do its thing" can vary. Please refer to the below diagrams for measurements depending to specific Jimmy Jib setups. The jib is usually built into its own base which in turn can be mounted on large rubber (off road) wheels or studio crab dolly wheels. The section of the fulcrum point extends out at varying lengths depending on the reach of the arm you're using, up to a maximum of 13.2 meters (40 feet). The rear section extends away from the fulcrum in ninety centimeter (3 feet) intervals up to a maximum of three meters (9 feet) - but room also is required for the operator to stand at the back and control the boom arm. How does the remote head work? The remote head (or hot head) is operated with a joystick control panel. The controls are connected with a cable to the head, which contains fine pitch controlled electrical servo motors and gears. These are configured to allow the operator to pan, tilt and with an additional "slip ring", roll. This hothead is silent, allowing for effective operation in sound sensitive production environments. How many people does it take to operate the Jimmy Jib? Usually, two operators are required for the operation of the jib. One person "swings" (moves) the actual counter-balanced boom arm, whilst another operates the hot head. We supply all the operators / technicians required for operation of the Jimmy Jib. How long does it take to set up a Jimmy Jib? We will always ask you to allow one hour for a jib to be set up on a flat surfaced area, yet the jib is usually ready for operation in forty-five minutes. If the location is more hazardous, more time is required. It also takes around ten minutes to fit and balance the camera on the hothead. 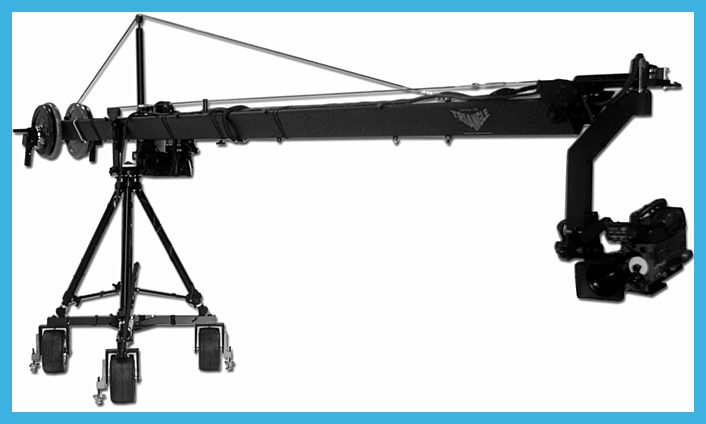 Can the Jimmy Jib carry 4k or 6k Digital Cinema cameras? Yes, we often shoot with some monster cameras including all the bolt-on’s. Depending on the size of Jimmy Jib built, the safe working load varies from 27.5kg to 11.3kg. Give us a call and tell us what camera you want to shoot with. Which cameras do you use with the Jimmy Jib? We love new technology and are excited to use new cameras as they’re released every few months. On location we often shoot with Digital Cinema cameras like the Sony FS7, Arri Alexa, Arri Amira and also the RED or Phantom High-Speed camera now and again. We’re also still asked to shoot with the well established Sony PMW-200 or PDW-F800. As for Studio or OB shoots, we happily work with whatever the facility wants to provide. If a Focus Puller is required to operate the lens control for focus/zoom/iris, you will need to check with them if they prefer a wireless or hard-wired control unit. For the hard-wired option, a 10 meter (30 feet) cable is the minimum requirement - as well as a video tap for the camera. The Jimmy Jib is frequently used in studio scenarios and can be supplied on studio crab dolly wheels built on to a converted HP pedestal, built onto a solid track, or mounted on a conventional dolly. Does the Jimmy Jib need a Technician or Assistant? All quotes include a Jimmy Jib Technician as a second person with the Jimmy Jib. This allows faster and sometimes more dynamic shooting as well as reducing possible hazards recorded in the Jimmy Jib Risk Assessment and as defined by the Health and Safety Executive. *The 40ft Jimmy Jib requires two Technicians. We are owner operators of the latest Jimmy Jib Triangle with a range from 6ft all the way up to 30ft reach and the ability to fly a wide range of cameras from the latest DSLR Canon through Sony XDCAM, Digibeta, P2, HDCAM all the way up to 16mm and 35mm film cameras including digital RED cameras. We can monitor the cameras output from PAL or upto full HD via HD-SDI cabling and monitors. Our Jib is available for a wide range of subjects. If you can think of a genre, we can provide a way of flying your camera, giving your shoot that extra dimension. Jimmy Jib Triangle Ranging in size's from 6ft. to 33ft, the Jimmy Jib's operating weight is considerably lighter than that of other full size cranes which means less operator fatigue and allows for much quicker jib moves for your fast paced production. Extreme Jib moves are our specialty!! We have extensive crew contacts nationwide and will travel to meet any production need! Over 20 years of televison production experience. 10 years of Jib arm operating experience.